1. Write a list of your top Spring must-haves. 1.) 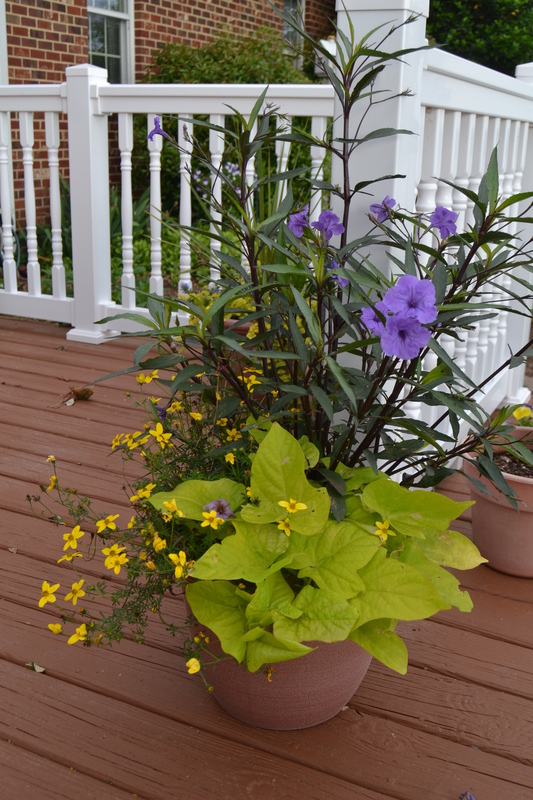 Mexican petunia, sweet potato vine and “whatever-that-little-vine-is-with-the-tiny-yellow-flowers”. …which, by the way, I like so much, I’ll probably have it in more than one place in the yard. 5.) And, finally, I’m going to, once again, try to grow nasturtiums. My mom planted them in window boxes, and I remember how pretty they were. My only attempt was in 2013, and shortly after I took this photo, this one died. But a friend has offered to give me pointers, so I’m trying again, hopefully with more success this time. So, if you’ll excuse me, I’m commandeering Motor Man’s pick-up this morning and I’m off to the nursery. 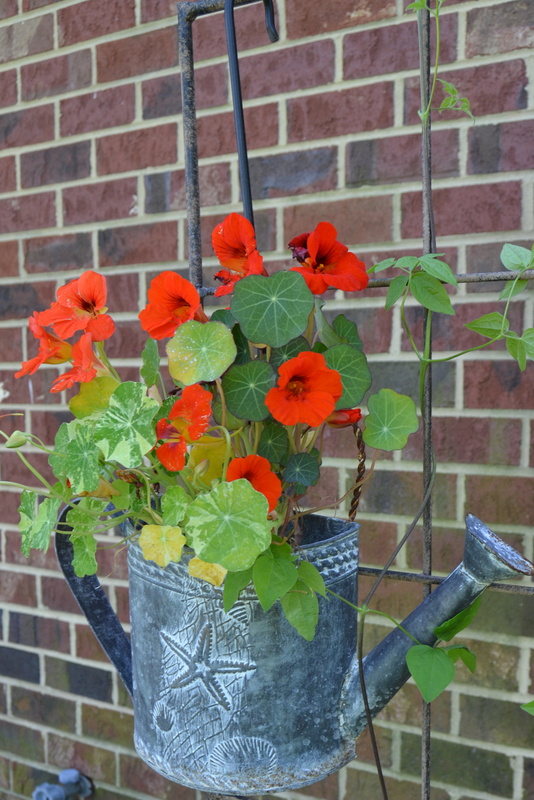 This entry was posted in Days at Home and tagged black-eyed susan vine, mama kats writers workshop, mexican petunia, nasturtium, purslane. Bookmark the permalink. Isn’t Spring wonderful??? I know you’ll come home with a truck bed full of beautiful plantings for the summer. Enjoy. Love your flowers in the pics. I’m all sorts of peanut butter and jelly because it’s snowing here. Go home mother nature! You’re drunk! Those are absolutely gorgeous. I cannot wait to dive into my garden once mother nature sobers up. I never knew that Black Eyed Susans came in a vine variety. Those flowers grow the best in my backyard because we have mostly full sun. I know the deer will appreciate your efforts!! But I’m sure you’re going to stock up on liquid “stench”, too. Even with the deer munching away, your flowers are always so lovely. Beautiful as always. The yellow flower is coreopsis (sp) I think. I have it in my pots by the front door. Trouble is you have to pick the spent flowers off to keep it pretty. I do it every morning when I get my paper. 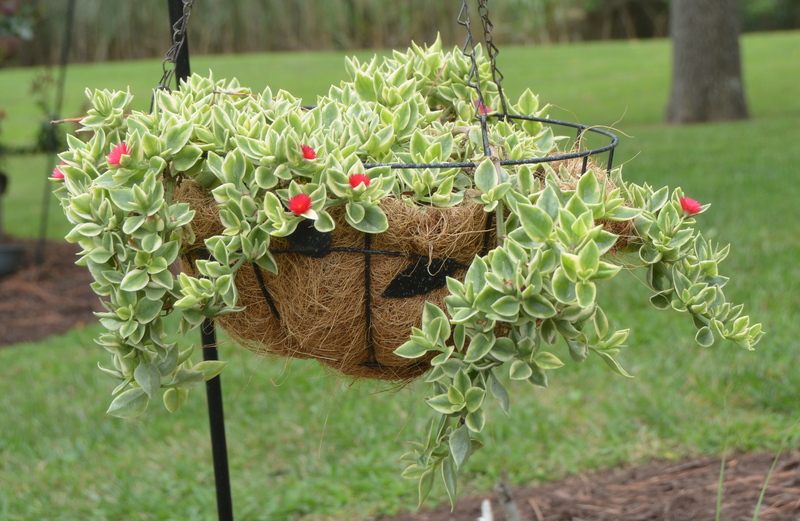 Lovely variety planted in beautiful pots, planters and on trellises. I think I must have all of those too, Dianna! So beautiful! I didn’t know there was such a thing as a Black-eyed Susan vine. I’ll have to look into it. We want to find a Carolina jasmine vine to replace our old one that finally died a couple of years ago. 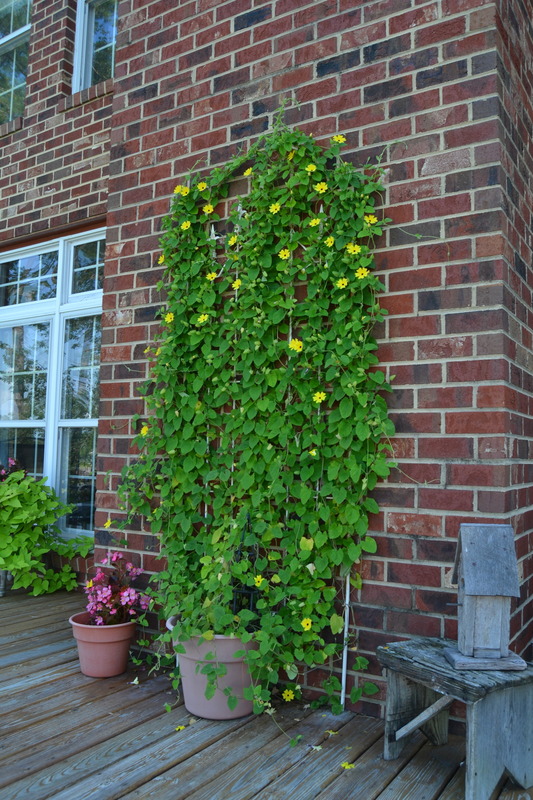 It stays green all year and has pretty yellow flowers most of the summer. 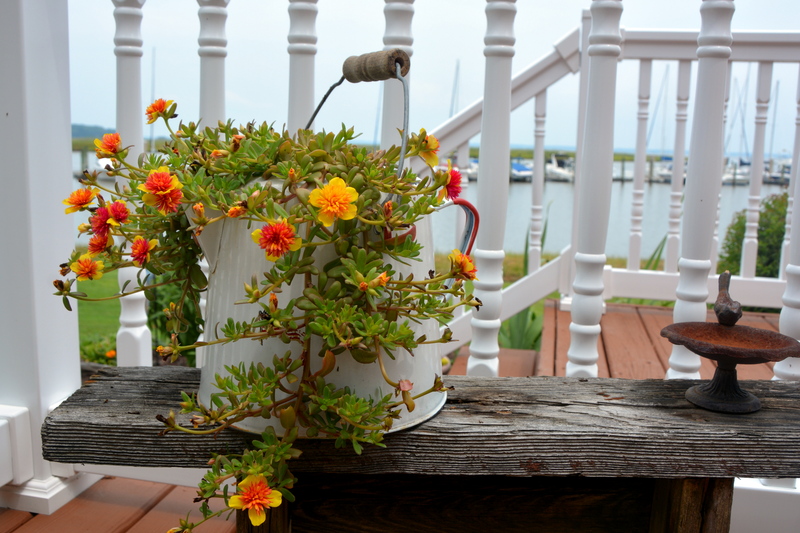 Gorgeous flowers, my favorite container being the watering can. Oh, I wish I could be thinking about spring must haves too BUT can you believe this? It’s blustery cold AGAIN and yesterday and today we’ve had bouts of snow flurries!!! Honestly…. That time of year again! – I’m looking forward to seeing what you do with the yard(s) this time around ! Ooo, I’m so jealous of that vine! Beautiful plants! I’ve never seen a black-eyed susan vine. Probably wouldn’t like my climate. You know you can eat purslane greens? It’s actually quite tasty in a salad. The black-eyed susan isn’t a perennial, but it does pretty well in our heat and humidity. I didn’t know that about purslane greens! Ooooh does the sweet potato vine actually grow sweet potatoes? I’ve been wanting to add those to my little garden bed! I’m not sure if the sweet potato vine grows a sweet potato: I THINK so! I know you can put a sweet potato in water, and a vine will grow. 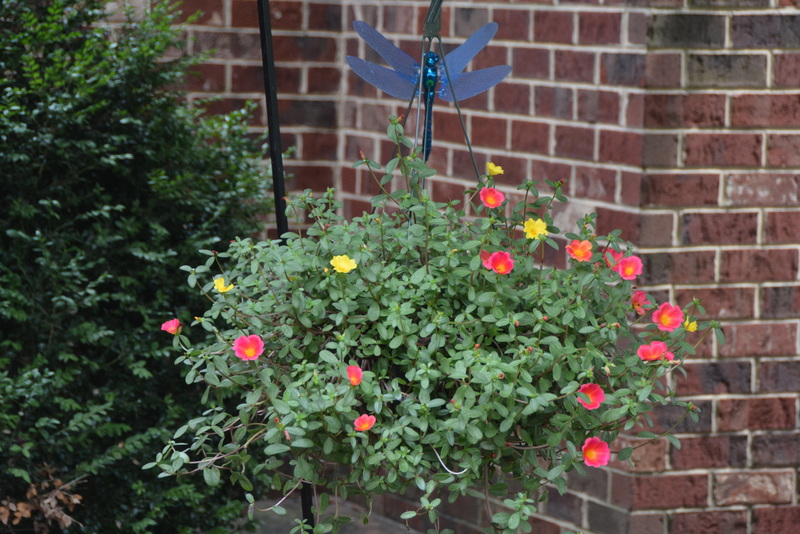 The “whatever-that-little-vine-is-with-the-tiny-yellow-flowers” in the pot next to the sweet potato vine, and Mexican petunia, is actually called “Bidens”. And, yes, you can eat the tubers from your ornamental sweet potato vines; however, they’re not nearly as good as the sweet potatoes from culinary plants. Culinary sweet potatoes are easy to grow though, even here in Central Ontario, Canada. They just need a long growing season, so start them early, and dig them up late in the season. Good luck! Oh, and the “gorgeous plant with tiny red flowers” is a variegated Aptenia, commonly called a variegated “Baby Sun Rose.” Your Back-eyed Susan vine is, btw, absolutely stunning! Do you overwinter it indoors? Or start afresh every spring? I’m glad there are so many knowledgeable gardeners! Love the watering can planter.